Yes, You heard correctly...Another Ethan Button Down Shirt. I'm sure you're thinking "another Ethan shirt!" And I would have to say, "Yep." This is a little different. It has short sleeves. 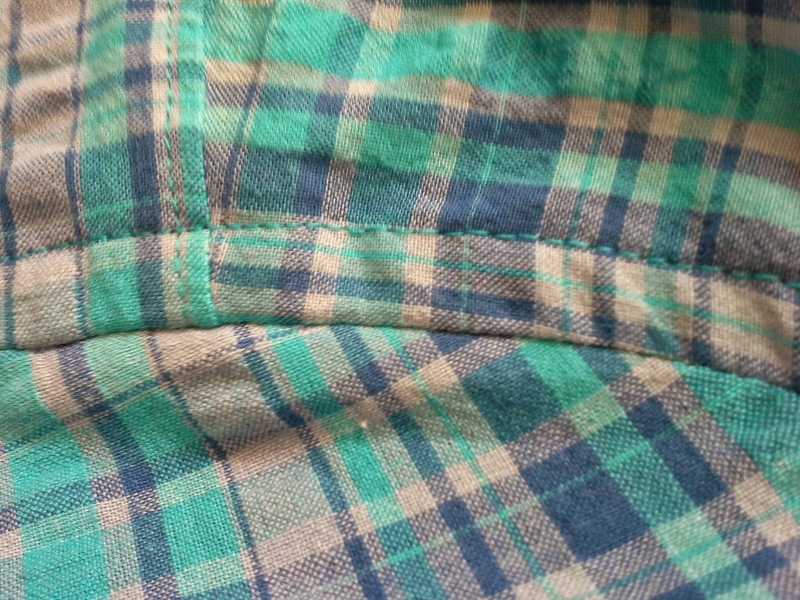 It is a plaid seersucker. I modified the sleeves and made a cut-on front placket and flat-felled seams. I did the plaid a little differently than I did the gingham Ethan. 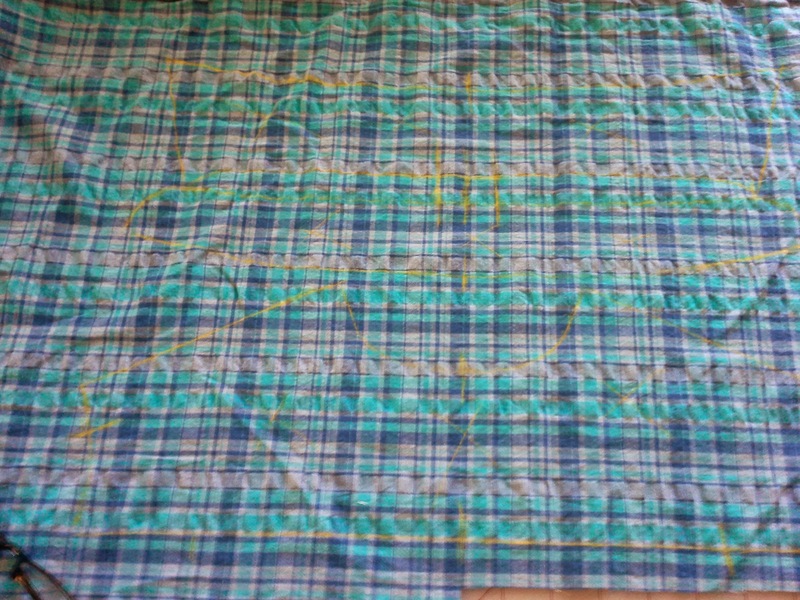 Instead of attempting to match this irregular plaid, I contemplated cutting the yoke and pocket on the bias. However, because I started daydreaming, I forgot to put the yoke on the bias. I had already cut the pocket on the bias. Middle Son told me he didn't want a pocket. Yippee! I didn't even mention the option of the bias yoke. He probably wouldn't care anyway. 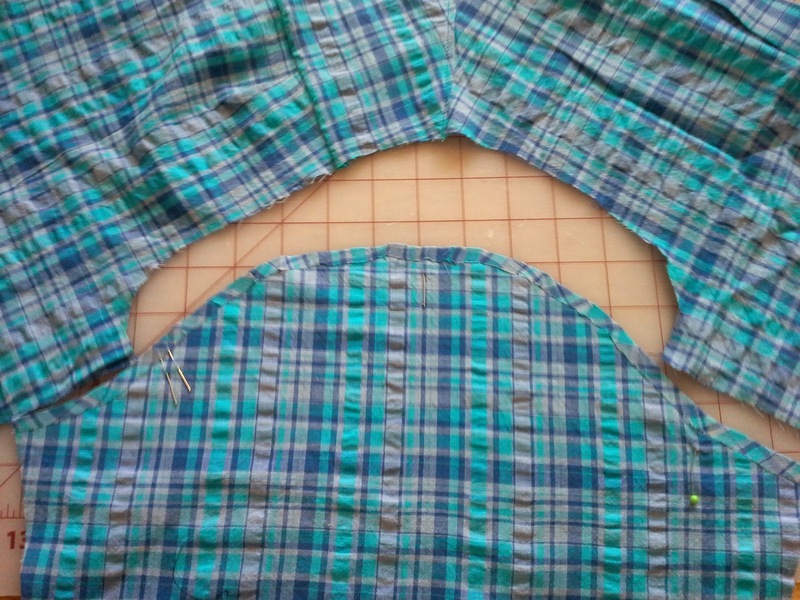 So, after I had made sure that the fronts and back were all matched horizontally, I made sure to cut the collar, band, and yoke all with the same line on the center. The difference from the gingham Ethan is that instead of cutting these out on grain, I cut them cross-grain. It is a common look, but not how the directions show. It is difficult to see, but I traced the pattern pieces using a chalk pen. piece to help me avoid accidentally mixing the up later. 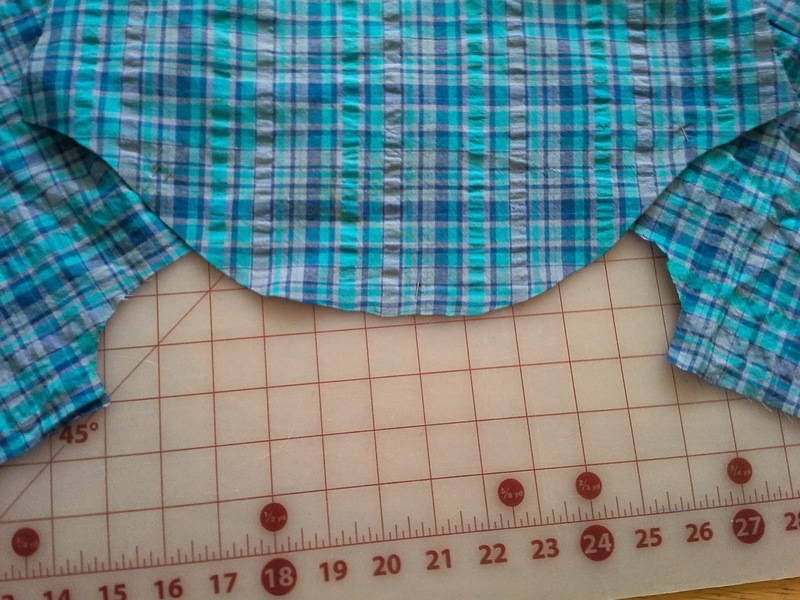 I also added 3/4" to the left front for the front placket. This is where the buttonholes are stitched. 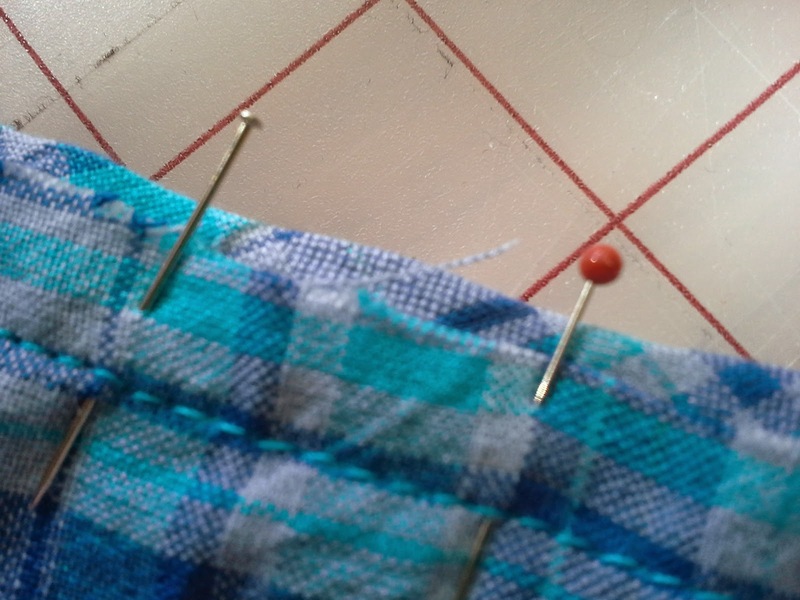 Instead of stitching the placket/band, I folded it back 1 inch, then 1 inch again. I then pressed and edge stitched about 1/8" from the edge. If you remember from the gingham Ethan, I forgot to flare out at the bottom of the sleeve when I cut it as a short sleeve. This time I remembered. I estimated that the hem would be about 1 inch. So, I marked where I wanted the hem and the amount to turn back. 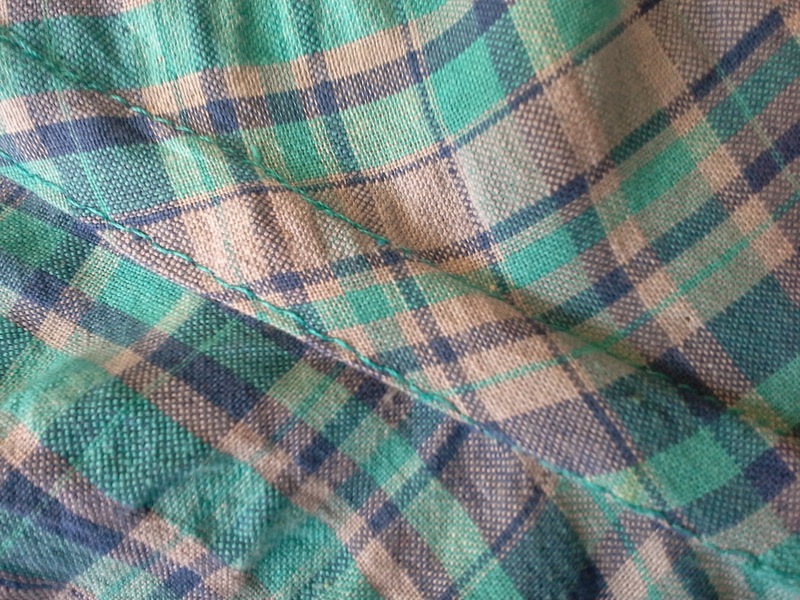 From where the hem would be turned, I flared out to match the taper, but in reverse. These are the main differences that I had to plan before cutting. From there, I started sewing away. Middle Son prefers flat-felled seams--yep, he notices--and because he is thin, I didn't need to add to the seam allowances. Tools to help me with the flat-felled armscye seams. For some reason, men's shirts have flat-felled seams. This makes a nice polished looking shirt. I managed to get some decent photos while making these, so I thought I would explain how I did it this time. I have multiple ways to do this and this is just one. I use the glue stick because this textured fabric did not hold a crease, making the glue a very welcome tool. The parts of the shoulder/sleeve seam. The armscye is the fabric on the body. The sleeve cap is the the upper rounded portion of the sleeve. The first I used a gauge to measure 1/4 inch, a glue stick, and my iron. As you can see, I use any glue stick. I actually measure 1/4 inch along the edge and put the glue along this edge. I also put a piece of paper under to avoid getting glue on my already stained ironing board cover while putting the glue on the fabric and remove the paper before ironing. This sleeve needs to fit in this armscye. Match the notches before sewing. Before doing the gluing, make sure to have the correct sleeve and determine which way to glue and press the sleeve piece. Because the raw edges are going to be enclosed in the stitching, it is important to remember which side is up while pressing the edge. I do this by putting the body right side up and the sleeve right side down while matching the markings--single notches to match the fronts and the top of the shoulder and yoke, and double notches to match the back. Then, I flip the sleeve right side up and will turn the edge with the right side up. After putting the glue on the edge, I turn in in--measuring again--and use the iron to dry the glue. This gave a very good fold and would hold while stitching. Don't worry, the glue will wash out. In fact, it is pliable and almost unnoticeable after ironing, except for holding the fabric in place. top stitch from the outside. Now comes the fun part! To pin the pieces together, match the notches--I use pins to mark at this point. But do not have the folded/glued edge and the raw edge even! The raw edge will be about 1/8 inch in from the outside folded edge. Once pinned, sew with 3/8 inch seam allowance from the raw edge and about 1/2 inch from the folded edge. If this allowance is not wide enough, the raw edge of the folded edge will be visible on the outside of the seam. Not good. I always check that my stitches are smooth and even on the top and the bottom. Unfortunately, this shirt had a problem in the same place on both sleeves and I had to rip about 4 inches out and restitch. It added about 5 minutes to my sewing time. If it is smooth, press the seam before opening, then press away from the sleeve so that the raw edge is not visible. 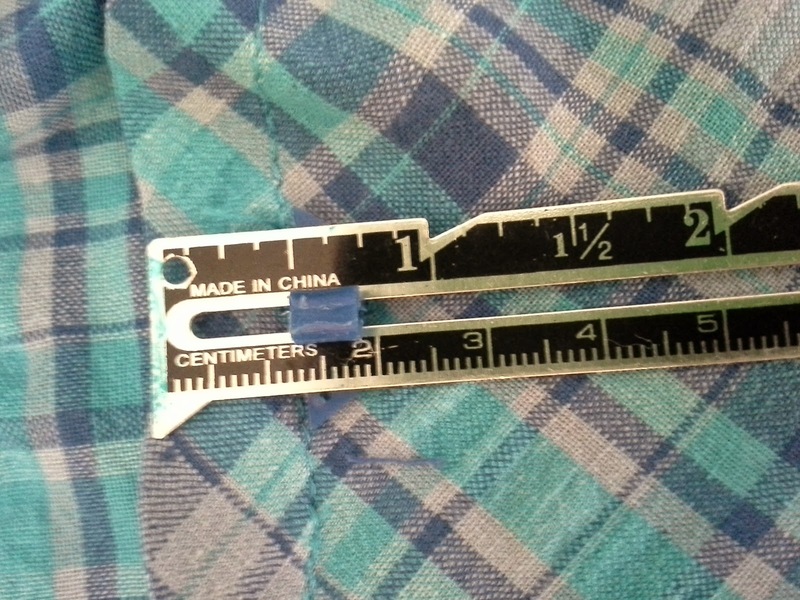 I measure this to determine the width of my top stitching from the outside. I then top stitch and double check that I have all of the raw edges enclosed. Stitching on inside of sleeve. Long enough to tuck in, if only he would. 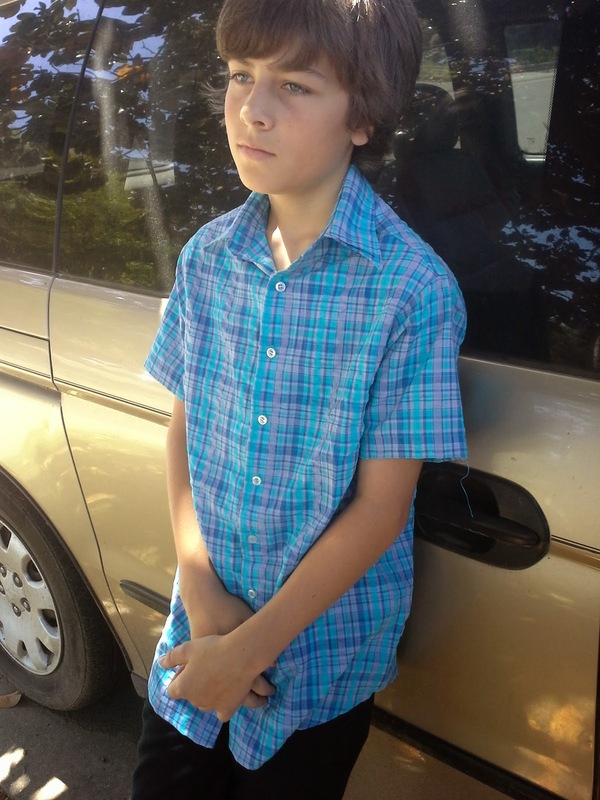 Middle Son likes his new shirt, but we both think it could have been a little shorter. I do like that it could be tucked in. Once his shorts are made, we can determine if this needs an alteration. Such a nice shirt! And wow to the flat-felled sleeves. That looks difficult! LOL! Thanks, Nakisha. The flat-felled seams aren't too difficult. I was hoping to take some of that mystery away. I hope you try them sometime. It looks really great, Annette. The length is perfect; he won't outgrow it too soon. Thanks. I think he is used to ready to wear being short so the correct fit feels odd. I'm hoping he can wear it through summer. I think this is his summer to do some major growing. Thanks, Vicki. This is a good color on everyone in our family, so it is the go-to when I want to add some color. Please don't be afraid of flat-felled seams. There are many ways to make them--some easier than others depending on the fabric. I don't know how I missed this shirt! It is fabulous, and well-made! Thanks, Vanessa. I did have some problems here and there, but sheer determination helped. This is my perfectionist son is a woodworker. He appreciates the craftsmanship involved. Wow, this an awesome shirt! You did an amazing job, and the details are spot on..
You are a goddess to make shirts for young boys. I make all my husband's dress shirts, so I know how much work goes into one - tho short sleeves simplifies a bit. Love your details, and seersucker - screams summer, doesn't it? I hope your son thinks he is lucky to have such an awesome mom! Thanks, Maris. They each get one or two long sleeves each year and one to three each summer as short sleeves. I actually find it relaxing to sew them and give myself one or two days for each shirt. They refuse store bought. I've created monsters! 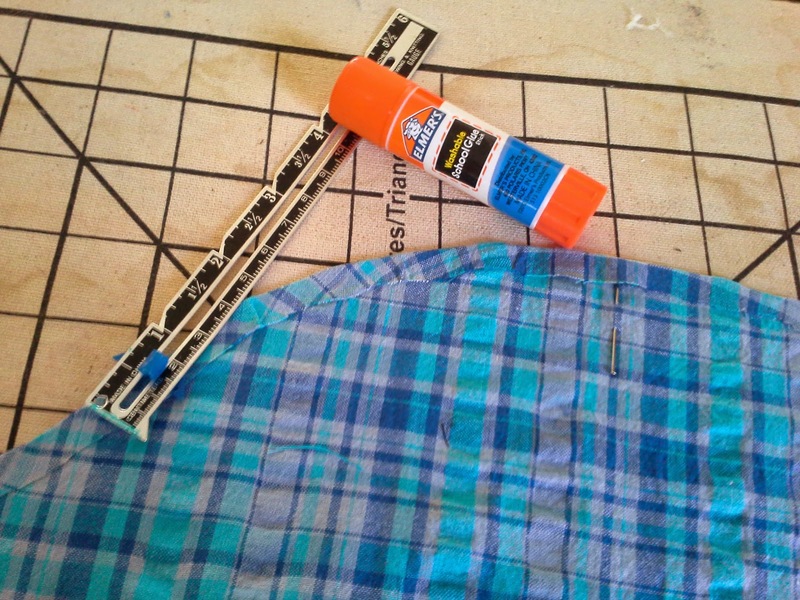 I make wide use of my glue stick and really loved your how-to make a flat felled seam with it! Thanks, Irene. Aren't glue sticks magical! I don't use them very often--the kids usually hide them or use them up. Sometimes I use starch or even nothing to hold it down. It all depends upon the fabric. That is a really nice shirt. You did a great job. It is fun to see some boy sewing. 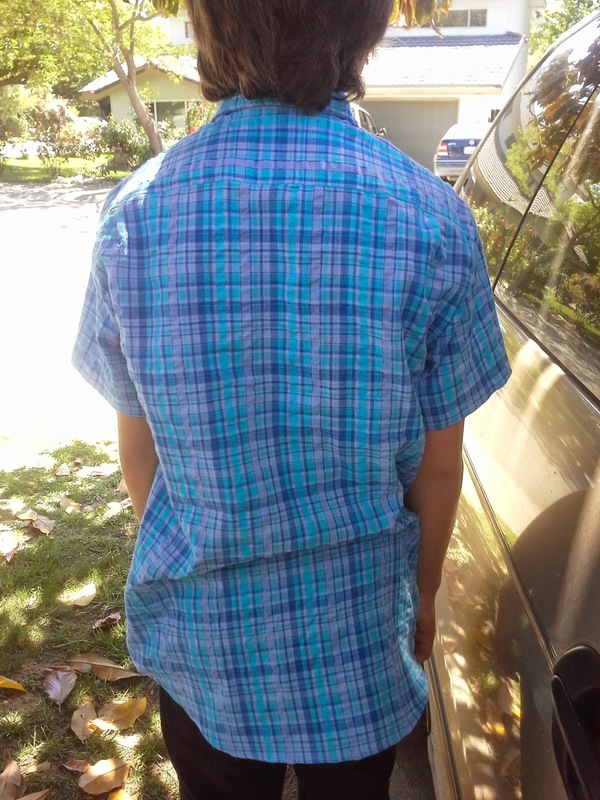 I am trying this pattern for my son for the first time (actually it's my first ever attempt at a shirt of any kind) and want to sew flat-felled seams, but was worried about the small seam allowances. Seeing yours just inspired me to go for it, without worrying about adding anything to the pattern. My little guy is on the slim side, too. Karolina, there are a couple of ways to do a flat felled seam. One is to do your seam allowances at the normal width, usually 5/8", then cut the one that will be on the inside. After cutting the seam allowance that will be hidden, fold the other over it and to the stitching. Then, press. Depending on the fabric, I might use a glue stich. The one I use most often is to off-set the allowances. The way, I can use a felled-seam foot or my regular. Using a presser foot for felled seams is easier, but only after some practice. For the shoulder/sleeve seam, try tracing and cutting the sleeve cap onto cardboard or an opened manilla folder. Then, mark the seam allowance.with a permanant marker. Use this to fold and press the seam for stitching. I have found it helpful to make an even fold and seam. It also folds over very smoothly. The best part is that you can fold the folder and save it with the pattern for next time. I use all of these techniques depending on what I am sewing. I hope you share your completed shirt. For some reason, I find sewing buttondown shirts to be very rewarding.